Blamsoft is paving a tough road to follow with their excellent suite of AU apps for iOS. This reverb is amazingly flexible for having such a stripped down interface. It invites you to just dive in and dial in the sound you need. I've been using the "Abbey Road" approach to reverb recently, and using the dedicated low and mid times along with the cutoff filter, it is very easy to strip out the highs and lows and keep the reverb in the mids. But that's just one example. 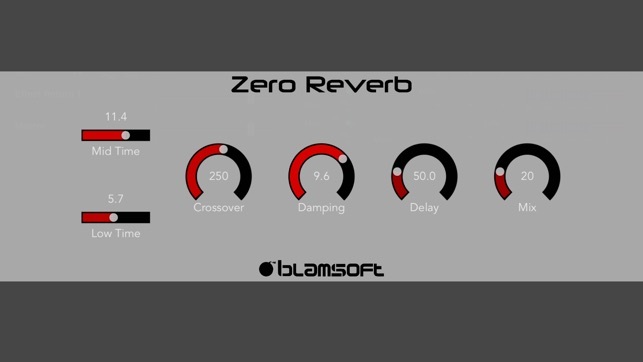 This is a class app capable of very nice reverbs for just about any occasion. And you can't beat the price! Highly recommended. Anyone who claims that this audio unit does not function properly in, GB, CB, Auria, BM3, Nano2 is not paying attention or something? IpadPro, iPhone 8. Good on all DAW’s. 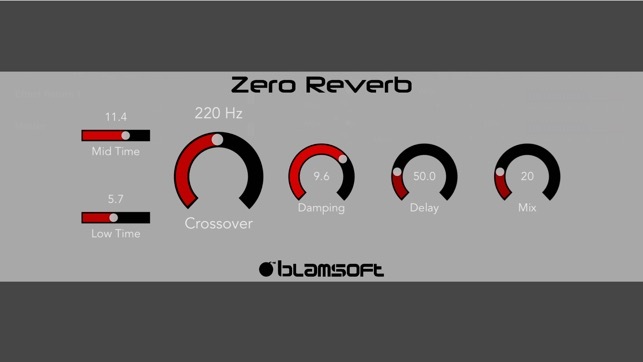 I like this reverb. It’s the 1st one I bought on iOS. I have everything in reverb land and it still has its own feel and sound. I like a lot. Developers: More stuff iOS eventually? Please? Big upgrade from most of the native plug ins for Cubasis and Auria. Simple clean interface ,really adds depth while still sounding natural. AU is very efficient and is not a CPU hog. Huge props for being one of the first with quality AU implementation.